As much as we try to eat a solid breakfast every morning, with a busy schedule and a few extra snoozes of the alarm, it never seems to happen on a consistent basis. Combine that with the never-satisfying-enough banana on the run and we’re left lethargic, hurried, and worst of all, hungry! This post is here to change that. One of our favorite weekday breakfasts is oatmeal because it can be made in a snap and topped with a never-ending variety of additions like brown sugar, honey, dried fruit, nuts, and berries. While we typically stick to old fashioned oats from Monday through Friday, weekends are reserved for nutty, chewy, and unfortunately long-cooking steel cut oats. Rolled oats take only a few minutes on the stove or microwave but steel cut oats take considerably longer, from 30-40, minutes on the stove. And one thing is for certain – we don’t have time for that on the weekdays. Since they have a very coarse texture, steel cut oats actually hold their texture and shape, even after being cooked and stored for several days, making them the perfect target for a weekend-to-weekday breakfast conversion. 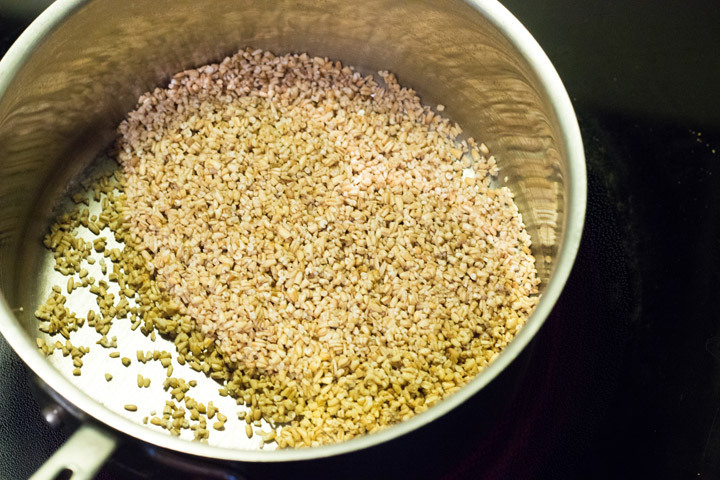 By bringing the oats to a boil with just water and salt, then letting them soak overnight, you let time do the work with no stirring required. 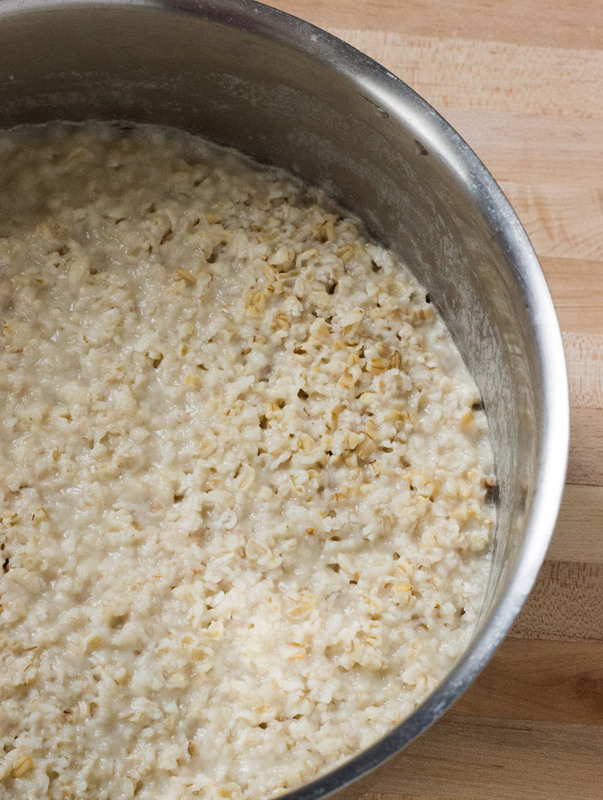 As you sleep, the oats soak up the liquid and soften just enough. In the morning, divide them up into jars, and toss in the fridge for breakfast all week. When you’re ready to eat, pull out a jar, add a splash of milk, and just reheat in the microwave for a breakfast on the go. Yes, it’s that easy to have a nutritious, delicious, and filling breakfast every single day. Here’s how to do it. Step 1: Melt 1 teaspoon of butter or oil in a saucepan over medium heat and toast 1 cup of steel cut oats for a few minutes to bring out their nutty flavor. This also helps them hold their shape. Step 2: Add 3 cups of water along with a big pinch of salt (about ½ teaspoon), bring to a simmer, and cook for 3 minutes. Remove the pan from the heat, cover, and let sit overnight (or at least 4 hours). Step 3: This is what the oats will look like after soaking overnight. Spoon the mixture into jars, filling them halfway. You’ll get about 4-5 depending on the size of your jar. Cover and store in the fridge. Step 4: When you’re ready to eat, just remove the lid of the jar, add a splash of milk or cream and microwave for 1-2 minutes until head through. Top with your favorite fixins’ like brown sugar, nuts, and fresh berries. Want an even easier way to take these on the go? Every morning, add the milk and fixins, cover, and take with you on the go. Microwave it when you get to work for a quick, healthy, handheld breakfast. The best part about this “recipe” is that it’s not a recipe at all, just a simple ratio: 1 part oats to 3 parts water. Make as much or as little as you need for the week and kiss your no-breakfast excuses goodbye. What are your favorite oatmeal toppings? Let us know in the comments below. Melt the butter over medium heat in a large saucepan. Add the oats and stir for 3-4 minutes until fragrant and lightly toasted. Add the water and salt. Increase the heat and bring the pan to a simmer. Cook for 3 minutes. Remove the pan from the heat, cover, and let sit for at least for 4 hours or up to overnight. 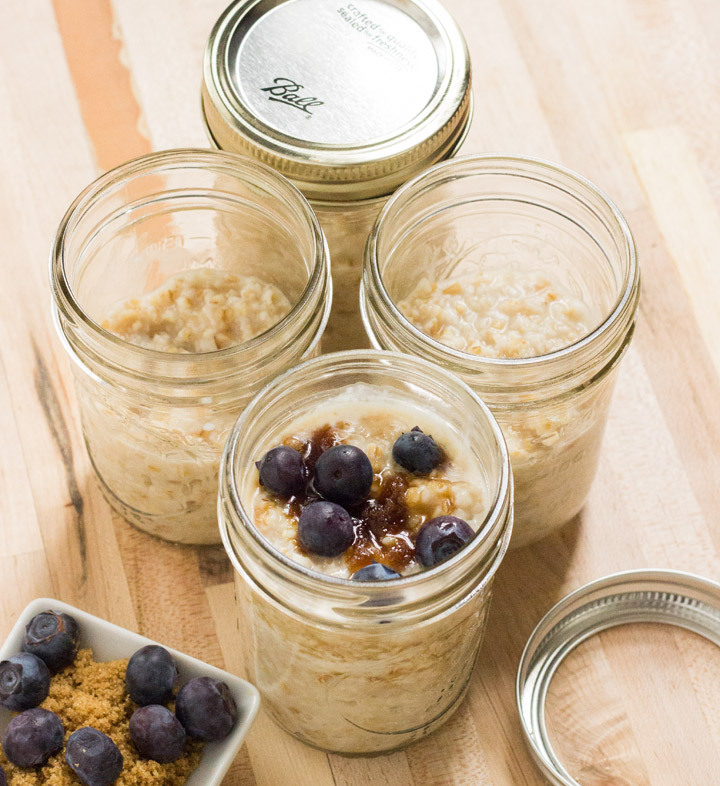 Divide the oatmeal between 4 or 5 jars, cover, and keep in the fridge for up to a week. To reheat, simply add a splash of milk and microwave for 2 minutes. Stir and add your favorite oatmeal toppings. How would you suggest reheating if you don’t have a microwave? @disqus_lD2YLJAW2S:disqus Great question! You can just reheat it in a small pan on the stove with a splash of milk until it’s heated through. You’re not really cooking it anymore, just reheating. So you would pour it out of the jar into a pan? Is there a way to heat it up and keep it in the jar? 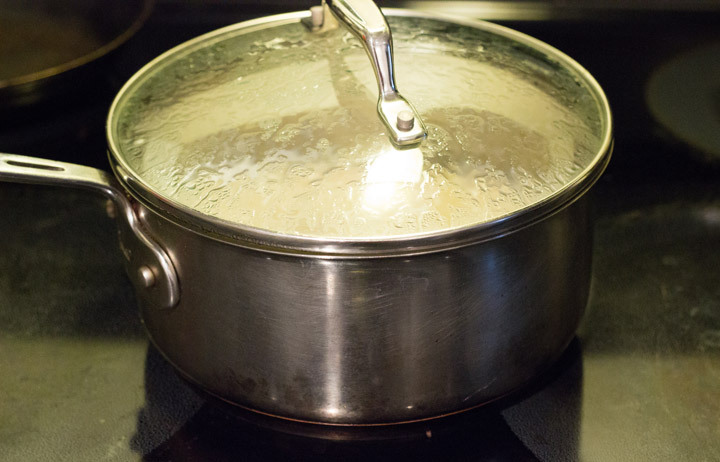 Have you tried putting the jar in water to re-heat on the stove? @disqus_lD2YLJAW2S:disqus We would probably just pour the jar into a small saucepan. You could probably reheat it in a simmering water bath as long as the water comes no more than 2/3 up the side of the jar. Also, loosen the lid (or remove it completely) to let some steam out. Otherwise, you’ll end up canning the oatmeal! I make overnight oats and eat them cold in the morning (don’t like using microwaves). They are still yummy cold! I bet these would be too! After separating into jars, can the “oats” be cooled then put in freezer? Yes, they can absolutely be frozen! However, I wouldn’t recommend freezing them in glass jars because the glass might shatter. Instead, you can store them in plastic freezer-safe containers or zip-top bags. Alternatively, you can portion the oats into muffin tins (that have been sprayed with cooking spray for easy removal). Freeze the oats in the muffin tin, pop them out, and store them in a zip-top bag. To reheat, just microwave for a few minutes until softened, add the milk, and heat until hot. 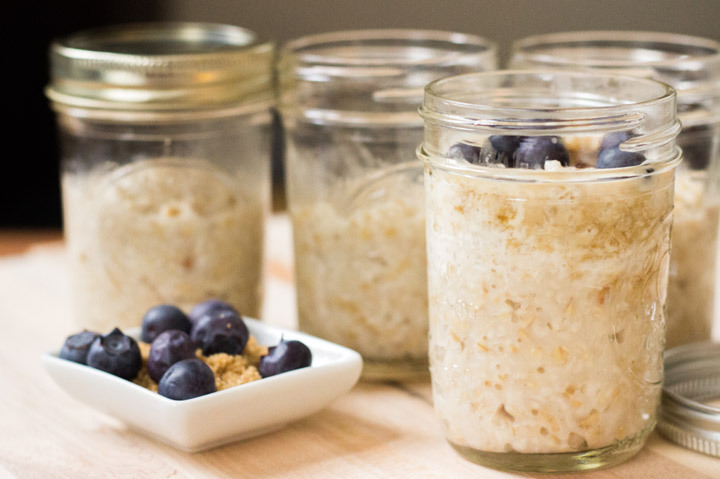 As long as you let the oatmeal cool, it is safe to freeze in glass jars. Leave an inch air gap for expansion. Check glass to make sure there are no chips or cracks. I’ve never seen steel oats-where do you get them ? I like almond butter or soybean butter and honey in my oatmeal. BTW, it’s OK to freeze in wide mouth ball jars. I freeze soup in them all the time. I would like to know why the water/oatmeal proportions with Bob’s is 1:3, while with steelcut from other companies is usually 1:4. I have been preparing steel cut oats this way for years: Bring 4 c. water to a boil. When it is bubbling, remove lid and pour in 1 1/3 c. Bob’s oats or 1 c. other brand. Add good pinch of Kosher salt. Cover and let rest overnight, or all day if you make them in the a.m. The oats will be ready to eat. Sometimes I gently reheat in the pan, or put a serving in a bowl and microwave. I leave the rest in the pan and refrigerate for the next day. This serves two of us for 3 days. We use pure maple syrup as a sweetener, and a small amount of milk. Sometimes we add fresh blueberries. I usually add a generous amount of wheat bran and flax meal for extra fiber. Can I make a big pot on say Sunday and it still be okay to eat a week later if I keep it in the fridge? ok, I think, but not as desirable. Every 3 days is our max. Yes, but it won’t be as good. I make it about every 3 days. I think it will, but the texture changes and it thins a little. I now make half this amount every other day and like it better. I add the bran and flax meal because it helps my particular digestive tract. I did this where you bring to a boil for a few minutes BUT then you put it in canning jars while still really hot. The cans will form a seal and then you tap the top to vacuum them. I did this for a huge batch as I am single… It was Awesome!! I just put them in the fridge and they lasted me 2 weeks. I’ve never done it where you leave it in the pan to put in the fridge. Why resting overnight? Why adding maple syrup? and Why extra bran? All practice is wrong. Make fresh daily put just till on ambient temp and no need to put extra fibre. No discussion seen on the DV. I followed the recipe, but found the oats to be too watery. Will it still work if I use less water? 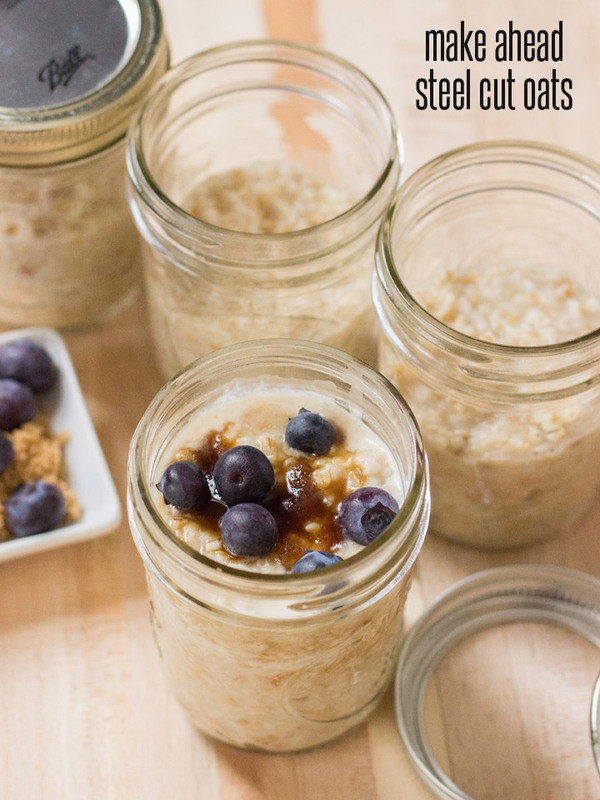 Do the oats soak in the fridge or countertop overnight? no milk please, it’s for babies!